I was first drawn to this scene by the man in the red and white striped booth in front of the Eminonu Mosque. I walked past him, but decided to turn around and take his photo. 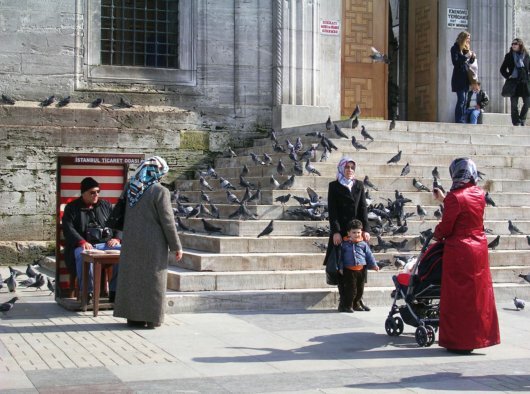 When I returned, this scene had just set up: the women, the birds, the red coat, the cellphone photo shoot, and the contrast between the women wearing hijabs and those without leaving the mosque entrance. The scene captured the colors and contrasts of the city; Istanbul as traditional and modern, secular and religious, in-between and both.